Families looking for Nevada colleges should start their search at GoToCollegeNevada.org. This is a general college search and information website sponsored by the Nevada Department of Education and Nevada System of Higher Education. The website has the usual timelines and provides an overview of financial aid with one of the better explanations of the significance of the cost of attendance. It lists all public 2-year and 4-year institutions but not the private ones. Users will find a calendar of events with actual events during the school year. There is a downloadable College Journey brochure with steps and timelines for attending any state institution of higher education. The section on Pay for College includes information and links to Nevada’s Millennium Scholarship and 529 plan. The website links to the Nevada Career Information System (NCIS) which includes a school search for institutions in all states. NCIS also provides a section on Paying For School that includes detailed information on the various types of financial aid along with links to net price calculators. Users can explore possible careers with various assessment tools. 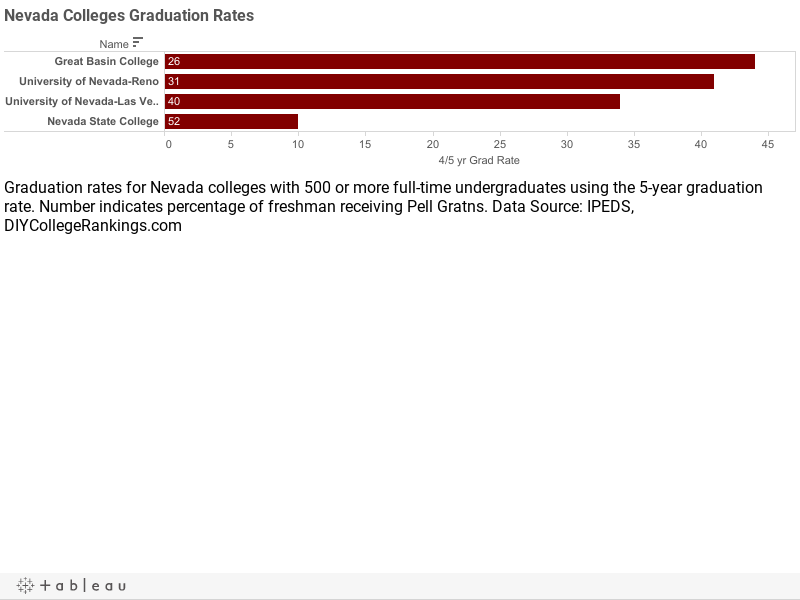 There are six four-year Nevada colleges with 500 or more full-time undergraduates according to the Integrated Post-secondary Education Data System. All are public institutions. The public universities have an average five-year graduation rate of 32.5%. No Nevada colleges meet the DIY College Rankings 50-50 profile requirements. The average SAT score for college-bound seniors in Nevada was 495 for Critical Reading and 494 for Math. The 75th percentile scores were 560 for Critical Reading and 560 for Math. Of the two schools that reported SAT scores, only one had 75th percentile scores equal to or higher than the state in both categories. In the following table, the four-year graduation rate is used for private colleges and the five-year rate for public colleges. The data are based on the data available from IPEDS in December of 2014 which are available on the DIY College Search spreadsheet.